I think this is the first quilt that I photographed right after it came out of the dryer.I am glad that I decided to finish it – I really like how it came out! And my kids already wanted to cuddle up with it. Nice. I quilted this one pretty densely, free motion, your basic all over swirls. I wanted it to be densely quilted because of all the seam, a lot of which could not be pressed open. I prefer pressing my seam open because than the seams lay flat, if I press them to the side – there is always that tiny little “step” on the front, which I don’t like. I was lucky that my machine didn’t give me any problems. The whole quilting process went pretty smoothly, with the thread breaking only once. 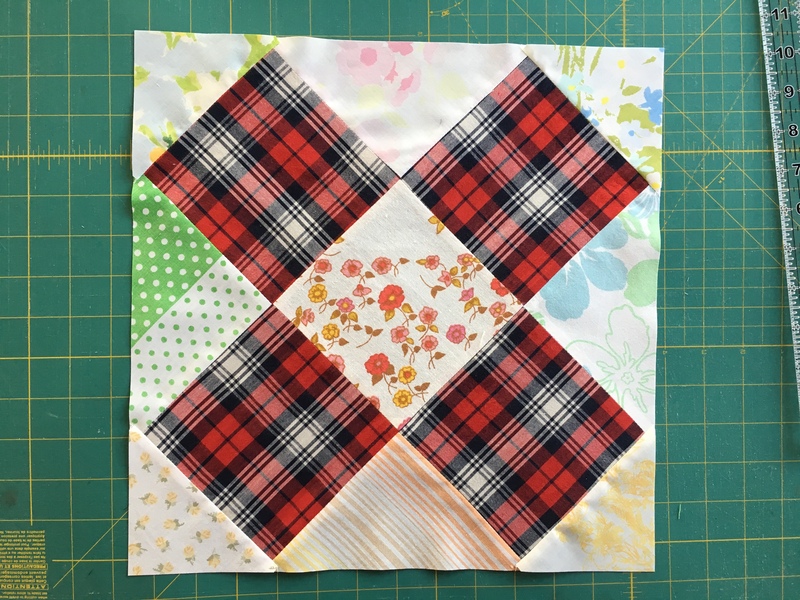 Last quilt – the dash-dot – I just could not free motion quilt. Skipped stitches, breaking thread – you name it. It just would not work. I tried everything. This time – Not one problem. I was a little worried about using all the colors – but I think it worked out. I don’t have a good binding picture – you can sort of see it below. It’s an orange stripey vintage sheet. The back is another thrifted find. It’s from an Ikea comforter cover. Cotton, a little stretchy, so I had a few snags – but when I washed and dried it – you can barely see it. I liked how it looked against light, so I had to take a picture of it…. See all the seams? I always liked hexagons, and one of those days I will attempt to do those tiny little ones. But for now, the big hexagons will have to do. Cutting for this quilt was very easy – each of the hexagons is made out of six rectangles in different colors. Two by two rectangles are sewn together and then cut apart – same as half square triangles – except that the end result is a little kite shaped piece, not a rectangle. Then you combine those into hexagons. And the white – simply strips. So there was no triangle cutting (I am not very good at that), or sewing on a bias (even worse at that). There is a bit more trimming maybe, but for me, that beats cutting and sewing triangles any time. This entry was posted in making, quilting, sewing and tagged Tolva quilt on February 28, 2012 by flekka. This looks very pretty with all the different colours. This is lovely! Nice work. This is such a pretty quilt. Thank you for your generous description of the process. I would love to give one of these a try someday. Beautiful work!! Did you use a pattern for this. If so will you share the name and/or designer? I love the sashing around the hexagons. Hi Nina, I love your design. Thanks for posting the picture with light shining through. I think I might be able to figure it out once I’m at my cutting board and machine, but what has me scared is the white sashing. I so want to avoid Y-seams (I hate them more than triangles!). So that is my first question, and the other is what is the size of rectangle that you start with? A tutorial would be very helpful, or if you publish the pattern, you would get more credit for your design. i love this design! what size of rectangles did you start with? would love to see a tutorial! Fabulous quilt, and all the color is perfect. I love the colors, what a lovely quilt! Okay, I need your help. I love this block and I’ve been trying to re-create it with no luck. What size rectangle did you start with? You say 2×2 in your instructions, but that’s a square. 😉 I tried 3×6 and I didn’t get a straight edge when I sewed 3 ‘kites’ together. So then I couldn’t put the two halves together.2×4 was super small. I would love any help you can give me! I love this quilt and would love to have a tutorial for it. Have you written some instructions? What size rectangle did you start with. The sashing has be baffled. Thank you! It’s been so long I made this quilt… And I have planned to make a tutorial but… you know how it is. I have a couple of more quilts waiting to be finished that use a similar method, so once they are done I will be ready to write some instructions. Hopefully soon. Probably May.